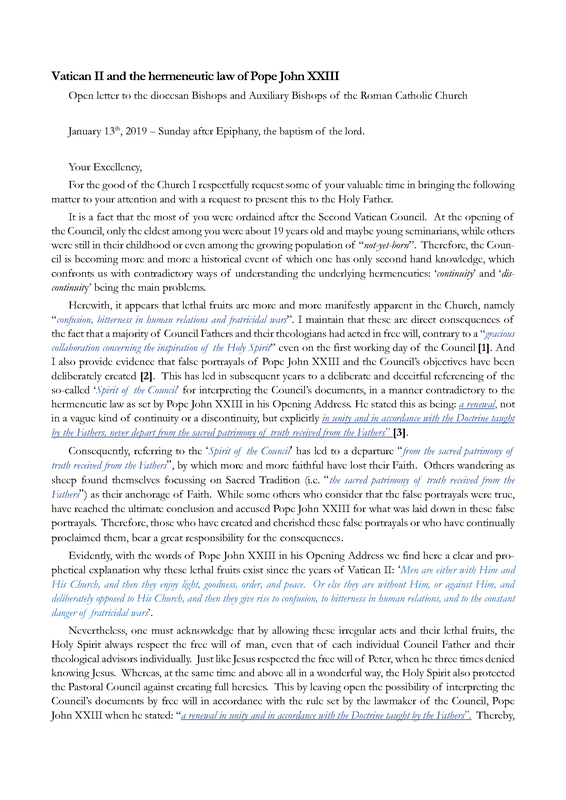 This letter has been sent by e-mail to about 3100 Bishops (Diocesan and Auxiliary). January 13th, 2019 – Sunday after Epiphany, the baptism of the lord. For the good of the Church I respectfully request some of your valuable time in bringing the following matter to your attention and with a request to present this to the Holy Father. It is a fact that the most of you were ordained after the Second Vatican Council. At the opening of the Council, only the eldest among you were about 19 years old and maybe young seminarians, while others were still in their childhood or even among the growing population of “not-yet-born”. Therefore, the Council is becoming more and more a historical event of which one has only second hand knowledge, which confronts us with contradictory ways of understanding the underlying hermeneutics: ‘continuity’ and ‘discontinuity’ being the main problems. Herewith, it appears that lethal fruits are more and more manifestly apparent in the Church, namely “confusion, bitterness in human relations and fratricidal wars”. I maintain that these are direct consequences of the fact that a majority of Council Fathers and their theologians had acted in free will, contrary to a “gracious collaboration concerning the inspiration of the Holy Spirit” even on the first working day of the Council [Ref. 1]. And I also provide evidence that false portrayals of Pope John XXIII and the Council’s objectives have been deliberately created [Ref. 2]. This has led in subsequent years to a deliberate and deceitful referencing of the so-called ‘Spirit of the Council’ for interpreting the Council’s documents, in a manner contradictory to the hermeneutic law as set by Pope John XXIII in his Opening Address. Pope John XXIII stated this as being: a renewal, not in a vague kind of continuity or a discontinuity, but explicitly in unity and in accordance with the Doctrine taught by the Fathers, never depart from the sacred patrimony of truth received from the Fathers” [Ref. 3]. Consequently, referring to the ‘Spirit of the Council’ has led to a departure “from the sacred patrimony of truth received from the Fathers”, by which more and more faithful have lost their Faith. Others wandering as sheep found themselves focussing on Sacred Tradition (i.e. “the sacred patrimony of truth received from the Fathers”) as their anchorage of Faith. While some others who consider that the false portrayals were true, have reached the ultimate conclusion and accused Pope John XXIII for what was laid down in these false portrayals. Therefore, those who have created and cherished these false portrayals or who have continually proclaimed them, bear a great responsibility for the consequences. Nevertheless, one must acknowledge that by allowing these irregular acts and their lethal fruits, the Holy Spirit always respect the free will of man, even that of each individual Council Father and their theological advisors individually. Just like Jesus respected the free will of Peter, when he three times denied knowing Jesus. Whereas, at the same time and above all in a wonderful way, the Holy Spirit also protected the Pastoral Council against creating full heresies. This by leaving open the possibility of interpreting the Council’s documents by free will in accordance with the rule set by the lawmaker of the Council, Pope John XXIII when he stated: “a renewal in unity and in accordance with the Doctrine taught by the Fathers”. Thereby, given that the Council was set up as “Pastoral”, the full Doctrine of the Church is the leading guide and has to be maintained “pure and integral” and undoubtedly “without attenuations or distortion” [Ref. 4]. Please, I humbly beg you for your heartfelt and sincere prayers for the Holy Father. While Pope Francis has been drowned in, and as such betrayed for more than 55 years, by the dissident liberal spirit of the Jesuits, he certainly needs and deserves our spiritual support. So that, as St. Peter initially denied to know Jesus thrice, similarly, he may have a change of heart, following which he can also confirm his brethren. With my heartfelt gratitude for your kind and generous consideration, I offer you the assurance of my filial support and prayers, I hope for a speedy reply, and I humbly ask for the grace of your blessing. The Opening Address by Pope John XXIII on the on the Vatican website only in Latin, Italian, Spanish, Portuguese. The English translation can be found outside the Vatican website here. Cardinal Liénart, a member of the Presidium, reading a paper prepared by Mgr. Garonne. This was doubly irregular, firstly the intervention itself, and secondly by addressing the request for changing the Council’s rule for that specific day to the Council Fathers instead of towards the Holy Father. An intervention by Cardinal Frings, also a member of the Presidium, confirming the intervention by Cardinal Liénart. He also did this in the name of Cardinal König, who did not belong to the Presidium. Evidently, this meant that these German Cardinals were informed by the French, prior to this first session. The applause that was started by a few Council Fathers, but which grew to include the majority. This occurred despite the fact that it was officially forbidden to applaud. The change of the Council’s rule by the Presidium. The lie by Cardinal Liénart to convince the Pope that his intervention, which was deliberate, premediated and prepared at the evening before was a spontaneous, charismatically inspired act. All these successive irregularities broke the council’s legal framework, putting Pope John XXIII in a situation of ‘a fait accompli’ and demonstrating a lack of ‘a humble and gracious collaboration with the intention of the Holy Spirit’. Surely, it is obvious that these acts have had direct consequences regarding the inspiration of the Holy Spirit for each individual Council Father involved. Among others, these false portrayals become clear by referring to the quote from the Opening Address of Pope John XXIII about the “prophets of doom”. Even during the Council, by using the pseudonym ‘Xavier Rynne’, a Redemptorist priest and theology professor had anonymously made such a false portrayals in his book “Letters from Vatican City”, which was internationally published in several languages. 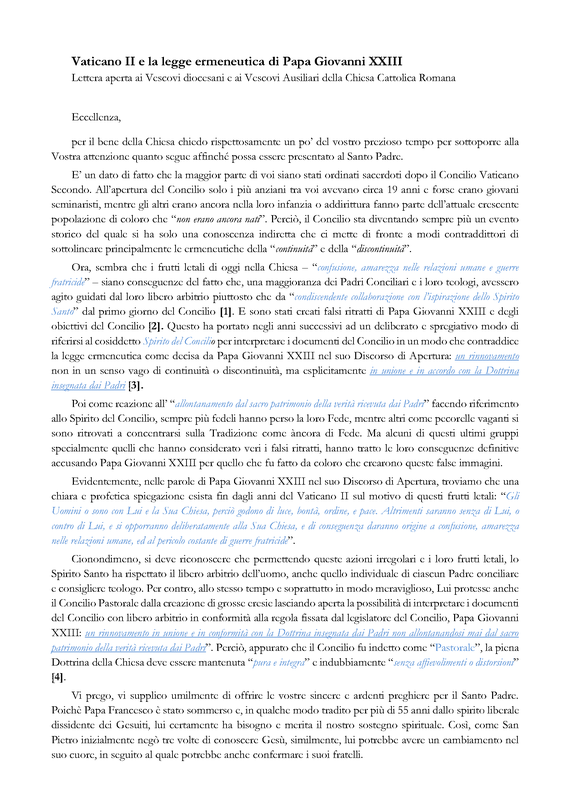 He wrote that regarding this quotation, Pope John XXIII especially mentioned here the conservative Curial Cardinals, and that he would agree with the objectives of the dissident liberal Council Fathers. With this he made a statement that still is hugely cherished by the liberal wing, as it was recently referred to in that way by Pope Francis in his Opening Address to the Synod of Youth. So, to which of the following groups among the Council Fathers did Pope John XXIII refer to? Was it the conservative wing, who accepted to discuss the preparatory documents, which were called by Pope John XXIII in his Opening Address as the “initial gift of celestial grace”? At the time of the Opening Address, they had nothing to fear from this Council, and in what way would they have been motivated to predict “doom” scenarios for the Church and the world, by seeking to prevent the Council? Moreover, they had encouraged Pope John XXIII to call this Council. Or was it the liberal wing, who disagreed with this “initial gift of celestial grace” and worked on its replacement? They had at the time of the opening address, to fear for a full condemnation of their liberal thoughts by the Council, as this was clearly present in the preparatory documents and even mentioned in the Opening Address itself. Herein Pope John XXIII condemned the ‘uncertain opinions of men’ and the ‘new-born errors’, as well as he acknowledged that there certainly were ‘fallacious teachings, opinions, and concepts to be guarded against’. Isn’t it obvious that it must be the liberal wing? Because of their knowledge of the progress of the preparatory work, they had to fear most the outcome of the Council and therefore had every motive to come up with “doom” scenarios for the Church and the world to prevent the Council proceeding as originally planned. At the start of the Council, it was the liberal wing that confronted Pope John XXIII with “a fait accompli” by deliberately breaking the Council’s rule on the first working day of the Council, creating a conditional situation to reject and replace the preparatory documents. Wasn’t it the liberal wing which after the Council made efforts to replace the hermeneutic rule as set by Pope John XXIII’s objectives for the Council? Even despite Pope Paul VI repeated the original hermeneutic rule in his closure address to the Council: “never depart from the sacred patrimony of truth received from the Fathers”, they changed this rule for a vague and ambiguous terminology “spirit of the council”. In this way they were able to eliminate all undesired conservative influences, including the interventions by Pope Paul VI and the original hermeneutic rule of Pope John XXIII. To further explain and clearly illustrate these false portrayals, I beg you to consider the following quotes taken from the Opening Address of Pope John XXIII on October 11th, 1962. These were the stated goals and objectives of the Second Vatican Council, were they not? Men, without the assistance of the whole of revealed doctrine, cannot reach a complete and firm unity of minds with which are associated true peace and eternal salvation. To transmit the doctrine, pure and integral, without any attenuation or distortion, which throughout twenty centuries, notwithstanding difficulties and contrasts, has become the common patrimony of men. It is a patrimony not well received by all, but always a rich treasure available to men of good will. Clearly, these quotations from Pope John XXIII are fully in accordance with his Encyclical Ad Petri Cathedram, 1959, in which he condemned in harsh terms anyone who denies the revealed Truth or interferes by the spread of lies or indifferences. It is very obvious from these citations that Pope John XXIII showed absolutely no desire to change one iota of Doctrine. From this Opening Address one can only conclude that he sought the traditional teaching of the Fathers, his ‘recent and not-so-recent predecessors’, so that the primary rule of the Council should be understood as: a renewal in unity and in accordance with the Doctrine taught by the Fathers: “never depart from the sacred patrimony of truth received from the Fathers”?. And evidently a “renewal” clearly meant how ‘to transmit the doctrine, pure and integral, without any attenuation or distortion’. Thereby it appears that, as a ‘conditio sine qua none’, the use of the term ‘medicine of mercy’ may never be decoupled from the need to explain 'the validity of its doctrine more fully’ as he said: ‘pure and integral, without any attenuation or distortion'. He did not abrogate any condemnations made by his predecessors, rather he spoke about ‘uncertain opinions of men’, ‘newborn errors’, and ‘fallacious teaching, opinions, and concepts to be guarded against’ in a way he confirmed the condemnation by Pius XII in his Encyclical Humani Generis, of the main principles of the New Theology. Isn’t it obvious that the Council’s documents with their deliberate ambiguities, contradictory texts and one-sided use of the doctrine cannot be interpreted well, without the correct application of the hermeneutic that considered the full use of the Church’s doctrine: “never depart from the sacred patrimony of truth received from the Fathers”? This should be the hermeneutic rule for interpreting and referring to the Second Vatican Council. To provide you with more factual information on this statement, please, find here the additional document: Vatican II, a Council in threefold?. This document is the extended summary of two other reports. Report 1 is an observational analysis of the evaluation of male religious memberships since 1950 that can be found here , while Report 2 concerns a substantial analysis concerning the general process behind the observations in Report 1 (here ).